Our responsive design for Waltzing T Bear’s web site adapts beautifully to any screen. Waltzing T Bear came to us with one goal in mind – to create a professional website that would reflect the status of his growing business, Shirt Tie Designs. When Shirt Tie Designs was created in 1993, it was simply a small business that was selling a handful of creative T-shirts. Today, the company has grown into the largest licensing firm of the “Shirt Tie” design in the country. We were tasked with updating their website to reflect their evolution. Our work with Waltzing T Bear began with a clear and concise goal – to present the company as the professional entity it had grown to be. Waltzing T Bear is the sole-owner of the registered trademark to create T-shirts containing a printed tie. We needed to re-brand and re-design Waltzing T Bear’s web presence as a strong rights-holder, in order to help Waltzing T Bear experience a higher level of communication with their prospective clients. Once we laid out a strategic plan for the site, we began constructing some of the major functionality that would be required. It was important to everyone involved that the website be accessible (and functional) on any device or screen we could imagine. 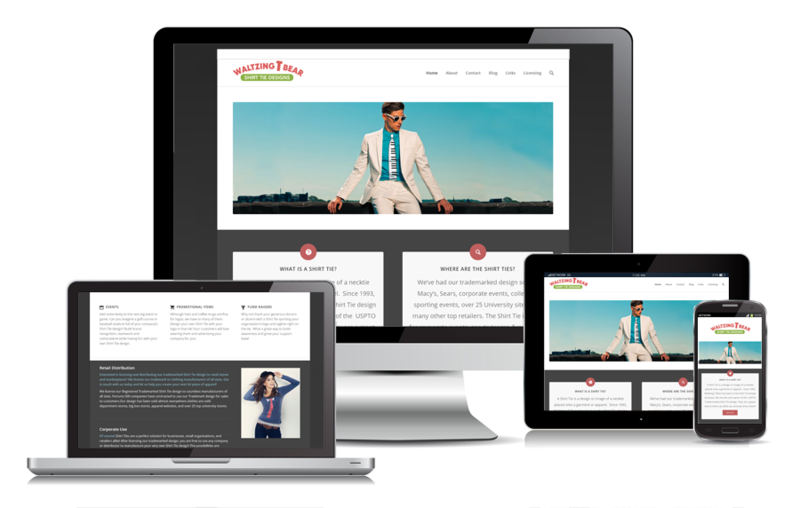 We employed a number of responsive design techniques to accomplish this. This meant that everything – the various contact forms, product showcases, the blog – had to fluidly adapt to whatever device our end-user was browsing on. Waltzing T Bear’s site is rendered beautifully on every device imaginable – from smartphones to high-end computer systems – and everything in-between. Can we help you with your web presence? We have a team of talented web developers, designers, and copy-writers ready to assist you with your specific web needs. Whether you need a simple website for a brand new business, a complex network of e-Commerce online shops, or just a quick face lift – we can help.